Very clever, indeed. The bag would also prove useful for athletes or anyone else who needs to bring along an extra pair of shoes. No one ever carries their shoes around in the shoe box after they’ve bought them, but a bag would allow people to easily carry around muddy shoes with no problem. But without shoe boxes what am I supposed to keep my cassette tapes in. Very nice idea tho. I’m going to criticize it (slightly). They should have actually made it bigger so that the bag could have doubled as a “grocery bag” – that way the cardboard portion could have doubled as a stiffener at the bottom of the bag. Plus, it still says Made in China, so that defeats most of the purpose of reduced shipping costs. I’ll hand it to them for having good intentions and at least for doing something. um, this is just BRILLIANT! and it looks fab, too! @Teresa – Do you have microscopic vision? Where does it say Made in China? Also, I don’t know if your grocery bag idea would have been practical. Are the people who buy Pumas going to be the same type of people who want a bag to bring with them to the grocery store? There’s a chance they could be, but I don’t think a shoe company should concern themselves with appealing to a grocery store’s customers. These two types of businesses just don’t have a strong enough relation. Teresa– no reason you can’t use it as a lunchbag instead. Quite cool, I would buy it, event I am not a fan of Puma. Fabulous idea and design!! Many sports companies have green initiatives for their footware but fail to further this thinking to the packaging and extended materials. Props to Yves Behar and fuseproject! @ Christina – agree with you that they probably didn’t design the packaging with the relationship between sporting and grocery consumer in mind. i’d much rather use the bag as a shoe bag like u stated!! Teresa, most products are produced in China. 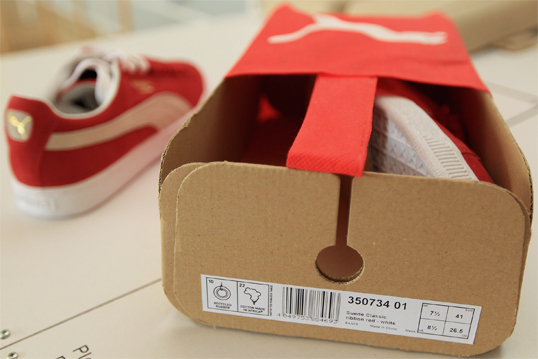 Some Pumas are produced in China, which will always defeat the purpose of shipping costs, but if the all cost productions are done in one place, it actually lessens the costs. Fact. You could google it. 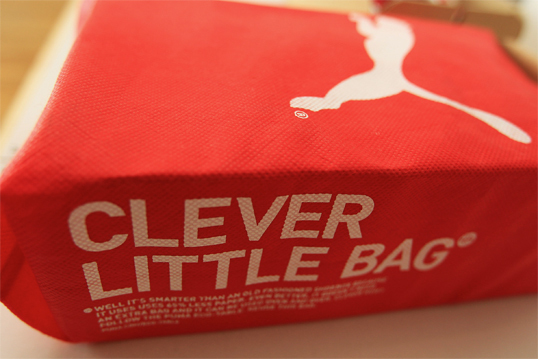 Christina has a good point about Puma not having to be concerned about the bag being multi-purpose. People, if they really wish to use it, will find various ways to go beyond it’s initial purpose as a shoebag. Mary, I’m sure that the package designers have considered the logistics of the packaging. Anything cubic, with a section will support weight, it’s basic geometry. One way to have answers to your doubts is to buy the product, or at least come close to it, at least it saves you all the musings about the packaging’s functionality. You can’t critique if you haven’t tried/used it or come close enough. To Mary: Perhaps the handle on the bag fits around that slit in the cardboard to lock it in place. I think it’s very cool and a step in the right direction. Quite frankly, I don’t see why there should be a disconnect bettween those who shop for Puma’s and those who shop in a grocery store. 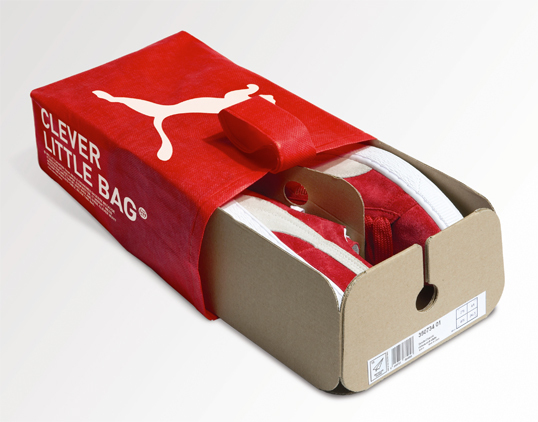 On the one hand Puma could simply take it to the next level by encouraging their consumers to reuse a larger bag for grocery shipping. It’s a win-win: reduced use of plastic grocery bags / increased brand recognition around the neighborhood. Oh and btw, I do not need to have microscopic vision, I can see “Made in China” next to the UPC. @Teresa – Yes, it’d be great for Puma to encourage their users to live green in other areas of their life outside of buying shoes, but it’s not a FAULT if they don’t. You might as well complain that the shoelaces aren’t decorative enough for people who’d want to wear them as a necklace, or the cardboard insert isn’t big enough for people who want to use it for break-dancing. Besides, the packaging needs to be compact in order to hold the shoes securely. If the bag was any bigger, then the shoes would have all sorts of room to flop about and get damaged. The only solution to that would be to add a fourth side to the cardboard insert, which would cause it to become, oh yeah, a shoe box. Yes, it is better than the old box however the outer bag still takes 3 times as long as your average shopping bag to breakdown….. well over 100 hundred years. Mary, see the box is tapered? That’s for stacking purpose. Hmm, what is it made from? What did you color it with? How long will it take to degrade? Does anyone know where I can find a website that showcases printed catalog designs the same way lovelypackage showcases? Would u carry ur groceries in a bag that ur shoes were in? They spent 21 months developing product…DO you think they forgot , shipping, stocking? How do you stack them on a shelf? @ Mary: To answer your question, which is a valid query, the loop of the bag slides through the notch in the cardboard and rests in the circular hole, stopping the cardboard part containing the shoes from being able to slide out in transit. well, I love it. I had to buy a pair for work, but I found, theres still at least 5 pieces of tissue paper in the packaging. So happy to see such an improvement, but thr article above is not completely accurate.